Kick off your exhilarating day out in London with a panoramic guided tour of the capital’s most well-loved landmarks. Familiarise yourself with one of the most popular cities in the world from the comfort of your seat, and use your camera or smart phone to get snap-happy. After driving past the historic royal wedding and coronation venue of Westminster Abbey in Parliament Square, you’ll have to tear yourself away from Westminster. The next stop is the equally enchanting St Paul’s Cathedral. Stretch your legs and explore this dominating church – the towering dome masks a number of tombs, memorials and intricately painted mosaics. See the world-famous Whispering Gallery, the Golden Gallery and the Stone Gallery as you discover more about Sir Christopher Wren’s masterpiece and the wedding venue of Princess Diana and Prince Charles. We can’t guarantee the Queen will be home (be sure to look out for the flag! ), but a photo stop outside London‘s Buckingham Palace is still a royal treat. Watch the Queen’s Foot Guard march to the palace alongside a military band during the traditional Changing of the Guard ceremony – they’ll be decked out in their eye-catching red outfits and bearskin hats. Refreshed and ready to delve into the colourful past of London’s most famous tower? The Tower of London conceals secrets that are equally fascinating, gruesome and inspiring. Be blinded by the glittering Crown Jewels or watch out for Anne Boleyn’s ghost lurking near where she was beheaded on Tower Green. Discover the Royal Beasts Exhibition, the Royal Mint and meet a Beefeater at one of London’s most historic landmarks! Get acquainted with the Beefeaters during an exclusive tour with one of the Yeoman Warders. Expect tantalising inside information and grisly stories from these ‘guardians’ of the Tower – they were once responsible for watching over ill-fated prisoners. If you manage to escape the formidable fortress, it’s time to head to the water and enjoy a relaxing River Thames Boat Ride. Take in the sights from the heart of London during this leisurely trip before docking at the beautiful Greenwich. Filled with history, Greenwich is a truly beautiful part of the city. Take a walking tour, led by your guide, covering such Greenwich landmarks as the iconic tea clipper Cutty Sark and the Old Royal Naval College, designed by Christopher Wren and discover its rich maritime history as you go. After your Greenwich adventures, you’ll board the boat back to Central London and soak in panoramic sights of the capital as you go! 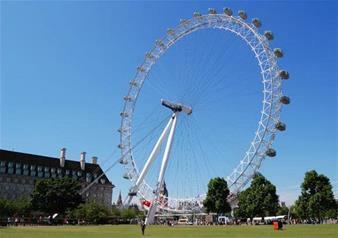 You won’t stay on dry land for long though as the soaring London Eye Experience awaits. Step into one of the iconic glass capsules and ascend 135 metres above ground level for spectacular sights of the capital! Try to identify the London attractions you have visited from the roomy glass capsule during this bird’s eye view of the city. On a good day, you can even see as far as Windsor Castle! Your tour will finish at approximately 6.00pm at the London Eye Pier. The perfect accompaniment to the Total London Experience, our free walking tour will get you up close and personal with a number of London hotspots well-loved by the rich and famous. Get inside information about the Royal family’s favourite London haunts or discover where iconic band The Beatles made music and let their hair down.